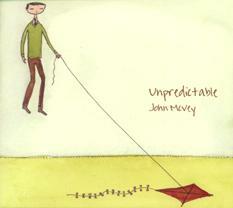 George Graham Reviews John McVey's "Unpredictable"
As if there weren't enough singer-songwriters, this week we have yet another practitioner of the genre. Though simple in concept, the format has such wide possibilities that it will seemingly never be exhausted. And this time, we have an artist who performs in more or less the classic style, but manages to sound fresh. It's John McVey, whose new, third CD is called Unpredictable. One of the things that can distinguish an artist in a crowded field is his background. And John McVey has a rather interesting one. A native of Princeton, NJ, he grew up surrounded by music from what would today be called "classic rock." He is said to have made his own first guitar at age 6 out of cardboard. But a couple of years later, his mother gave him a real one, a Sears Silvertone McVey still has, and he plunged into music, at first being self-taught, but then graduating as a music major from Rutgers University. He supported himself for a long time as a piano tuner. But he increasingly made inroads as a songwriter, winning various competitions in Philadelphia, Nashville and elsewhere, with his band and as a solo. McVey spends most of his time working as a producer/engineer at a studio in Boulder, Colorado, where he has created music for a number of television commercials and public service announcements. He has also been involved with CDs used nationally for pre-school music education in a program called Music Together. McVey has done recording and performing with the likes of Jonatha Brooke, Patty Griffin and others. With his career generally keeping him busy doing music for others, he is not very prolific recording his own music. His last CD, Jigsaw was released ten years ago, with his debut release in coming 1994. His new CD Unpredictable has at its core the classic folkie style of singer with acoustic guitar, and he does both very well. The backing musicians give the CD its broad-ranging stylistic mix, and include a couple of notable musicians from the Boston folk scene, where McVey apparently did a fair amount of performing. They include Jonatha Brooke, a significant singer-songwriter in her own right, going back to her days with the duo The Story. Playing a prominent role on guitar is Duke Levine, who often performs with Mary Chapin Carpenter. McVey produced the CD himself, but gives credit for the musical ideas contributed by the backing musicians. While many of the songs on the CD are broadly love-songs lyrically, McVey usually adds a distinctive perspective. And musically, the songs are often fairly sophisticated, not your typical three-chord folkie fare. McVey has a fairly wide vocal range and has one of those appealing folk-style voices, though in the context of the CD, he can come close to rocking out. He also did part of one song in a half spoken manner, and one track as a multiply overdubbed vocal chorus resembling Bobby McFerrin. While most of the songs are originals, McVey includes two songs written or co-written by Dana Cooper, who makes an appearance on the CD. Unpredictable, the new third CD by Colorado-based, New Jersey native singer-songwiter and producer-engineer John McVey is a fine recording that takes the basic folk-based style and takes it in interesting directions. The original songs are thoughtful lyrically and musically substantial, while the musical backing is tasteful and creative. With prominent contributions by vocalist Jonatha Brooke and guitarist Duke Levine, the backing musicians are a tasteful bunch who help to raise the songs to a further level. Our grade for sound quality is a "B-plus." The mix and general sonic textures are good, but the recording was over-compressed to the point that there is some significant audible distortion in spots. Once again, it's people trying to fight a CD loudness war, and ending up shooting themselves in the foot instead. Singer-songwriters are a dime-a-dozen these days. Even the good ones are too far numerous for a music fan to keep track of. But it's a musical format that has a rich tradition, and when in the hands of someone with the experience and talent of John McVey, it's a form that can reveal something new. It has been ten years since McVey's last album. Apparently not in a hurry to keep releasing music, McVey used the time to hone the songs into a most worthwhile recording.